WASHINGTON—In the moments following Alabama's 21-0 victory in the BCS National Championship Monday, President Barack Obama asked several advisers why he always has to be the one to call the winning team’s coach. "This happens every year. The guys obviously know I want to talk to them, but still I sit here and wait around until finally I’m forced to do the dialing," Obama said before groaning and asking his secretary to find him Nick Saban’s phone number. "They are national champions. I'm president of the United States. Am I crazy to think that one of the first things they'd want to do is call me? I'd just like to know I'm on their minds for once." 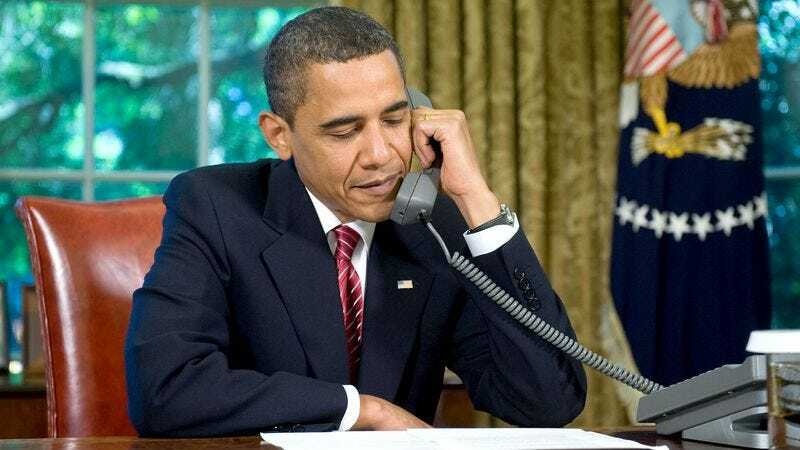 Despite Obama's disappointment with always having to initiate calls with national champions, he did add that he wishes the MLS champion L.A. Galaxy would stop calling him.